Harley, The Chihuahua, Is ALWAYS Held! The Princess In Her Bed, But Of Course Right Next To Mommy On The Couch! 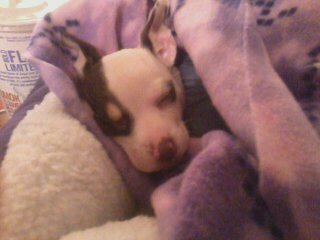 I have had my gorgeous 8 week old Chihuahua, Harley Madison, for just 3 days, and already she is spoiled rotten. I carry her around pretty much all day. She won't go up to her food bowl/water bowl alone to eat, Mommy or Daddy have to take her to it and sit her right in front of it! If I leave the house, unless it's to school, she goes with me, with her shirt, coat, and shoes on. Every single night she sleeps next to me in bed, curled against my hip right under my armpit. She will seriously sleep with me for 8 hours straight. Then in the morning she wakes up, whimpers and scratches at me and that's my cue that she needs to potty so I literally pick her up and put her on the pad for her to pee. If I don't put her on the pad she will pee on the floor. She won't go step on the pad herself (it's not that she doesn't know better, because apparently she was different with the original owner?). I feed her dry food, but it must have hot water added to it and be evenly stirred around, or she won't touch it. Her drinking water must be extremely cold bottled water. She loves her puppy bed during the day, but only if it's next to Mommy and only if Mommy puts her in it. When I take a bath she runs into the bathroom (if I lock the door she panics) and she will cry and bark until I pick her up and put her on the toilet next to the tub, where she waits for me, then expects to be picked up when I'm done. She loves her Daddy, but she's mostly loyal to me. She will play and play with him, but if I come in the room she forgets him and runs straight to me. If I go to the bedroom I must pick her up and carry her with me, she won't follow me, but if I leave her she whines. Trust me, I know it's bad, I'm practically raising her with a handicap, but hey I have 2 cats as well and they are nowhere near that bad, but they are spoiled. What can I say I'm 21 years old and Harley is my baby!